Not a single thing was going to stand in their way. The Timberwolves weren't going to be denied. Not even a 2-0 deficit, or a 3-1 deficit, or a fired-up Clackamas club was going to keep them from reaching those goals. 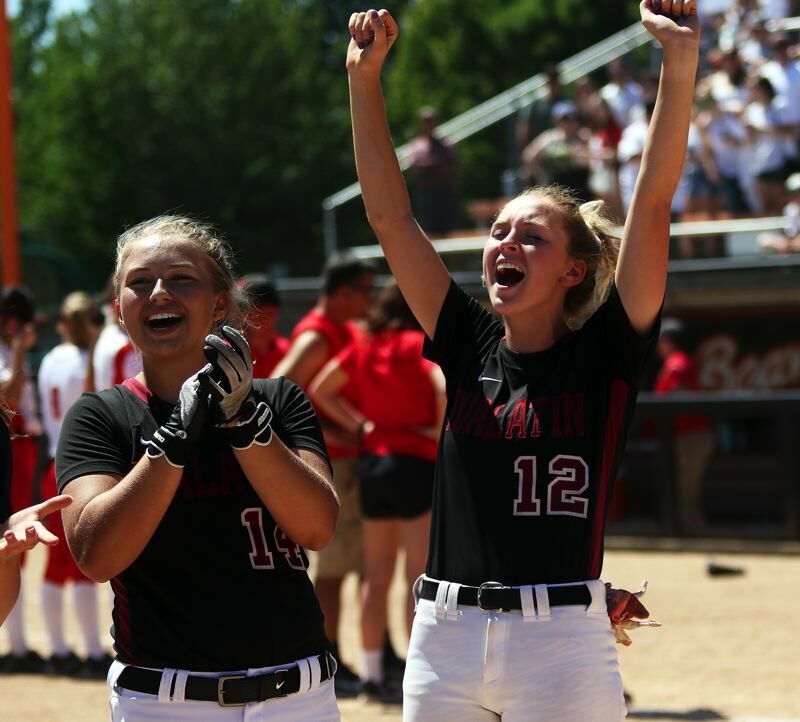 The Tualatin High School softball team wanted it all. And, in dramatic, thrilling fashion, the Wolves got it. 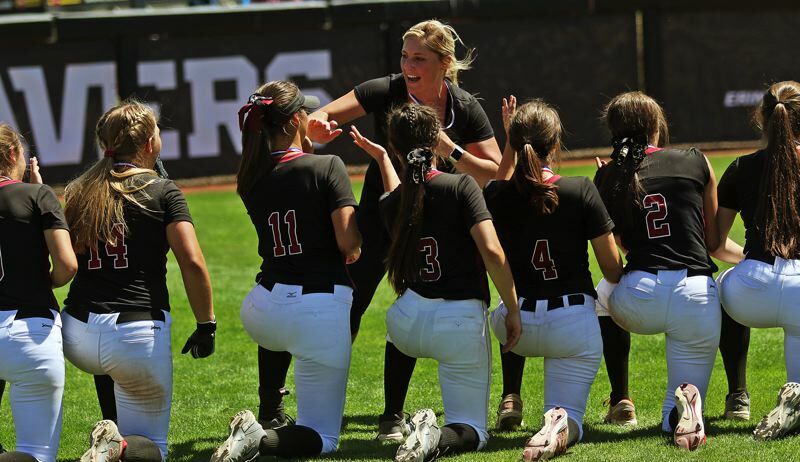 Tualatin put the wraps on an amazing, unbeaten season by rallying to get a 4-3, walk-off win over the Cavaliers in the OSAA Class 6A softball state championship game, played Saturday at the Oregon State University Softball Complex. "This is everything," smiling Tualatin senior pitcher Megan Woodward said during the Wolves' victory celebration. "We've worked so hard for this all season, and we're such a tight-knit group of girls. So, it's just fun to get a trophy with your best friends." 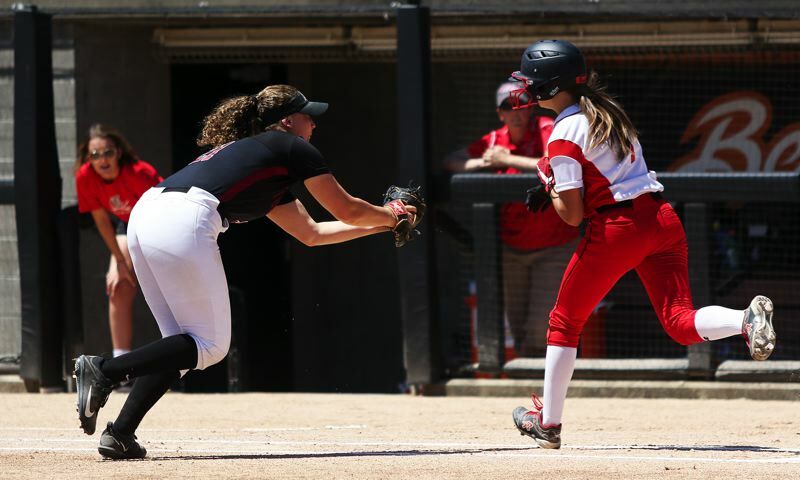 "This is an absolutely incredible experience, especially as a freshman," said Taylor Corcoran, who singled in senior Ella Hillier with the game-winning run in the bottom of the seventh inning. "I love doing this for my seniors, and the rest of the team." "It means everything," said Tualatin junior Emily Johansen, who blasted a game-tying two-run home run in the bottom of the fifth inning. "Coming in as a freshman, my goal was to be us right now, to become a state champion. That's what you want at the high school level. To achieve that is amazing." 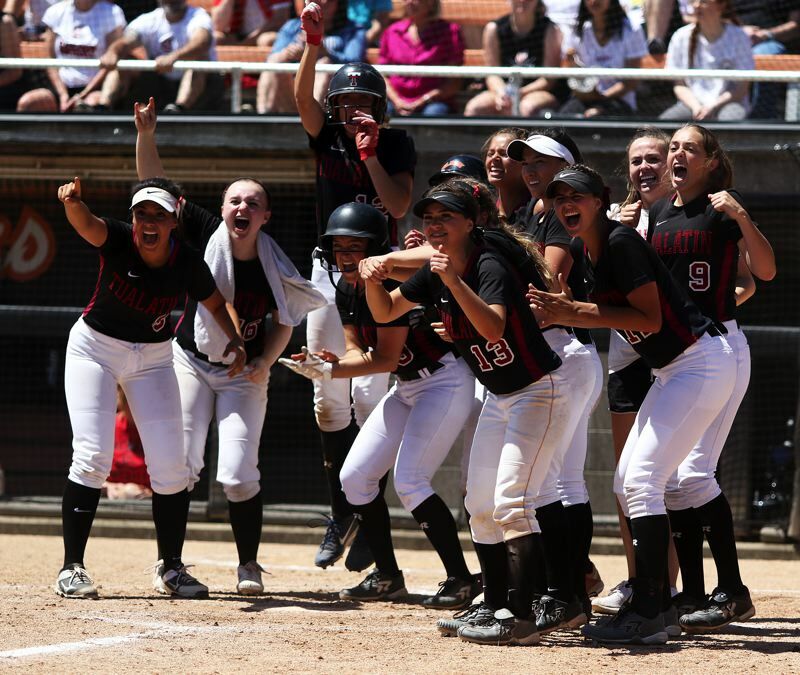 "This is crazy," Tualatin senior outfielder Zoe Olivera said. "Just getting this far feels so amazing. It means so much." 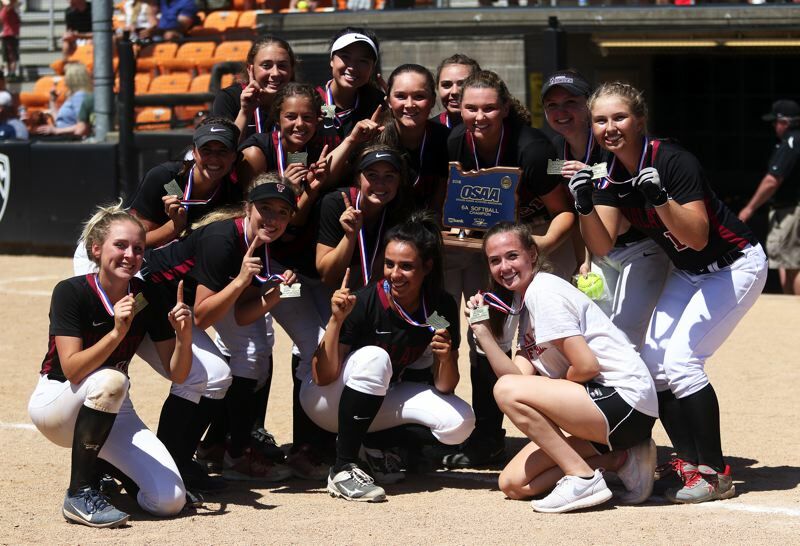 "Oh my gosh, it means everything," Tualatin sophomore shortstop Bella Valdes said. "Just all the work we put in. I've never been on a team that was able to come back like this." With the loss, Clackamas, the Mt. Hood Conference champion and the No. 2 team in the final OSAA power rankings, finished its season with a final record of 26-6. Tualatin, the Three Rivers League champion and the No. 1 team in the power rankings, finished its season at 30-0. The Wolves became the first team ever at the Class 6A level to go unbeaten on the season as well as the first "big school" squad to have a perfect season since Churchill went 23-0 in 1992. "It means everything," Tualatin senior Kayla Laird said. "It's great to keep the streak up, and never let up. It's an incredible feeling." "I just feel really relieved," Hillier said. "We prepared, and everything we did, we earned it." The motivated Clackamas team, which fell 6-2 to the Wolves in an early-season game back in March, grabbed the early lead in Saturday's title tilt, getting a run in the top of the first inning. Senior Kylee Vanderbout got things going for the Cavaliers with a one-out single to left field. She then scored on sophomore Alyssa Daniell's triple to center field, giving Clackamas an early 1-0 advantage. The Cavaliers then got a leadoff home run by senior Trinity Loeb in the top of the second inning, giving Clackamas a 2-0 lead. Tualatin got on the scoreboard in the bottom of the third inning. Sophomore Tia Ridings led off the frame with a bunt single. She moved to second base on a sacrifice bunt by Valdes and then scored on Hillier's single to center field, trimming the lead to 2-1. But Clackamas answered right back in the top of the fourth. Loeb hit a one-out double to center field, and then scored on sophomore Madison Stateler's two-out single, pushing the margin back to two, at 3-1. The Wolves tried to respond right away. Corcoran doubled to center field to lead off the bottom of the fourth. Olivera was then hit by a pitch and junior Andrea Gomez walked on a 3-2 pitch, loading the bases with no outs. 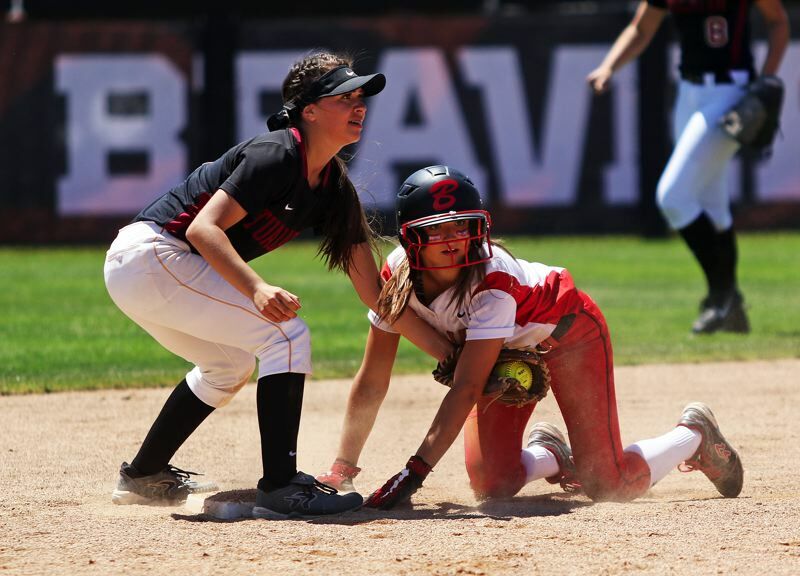 But Clackamas junior pitcher Shaylee Monise coaxed a fielder's choice grounder, with Corcoran being thrown out at the plate, a pop out and a then a strikeout to get out of the inning unscathed. 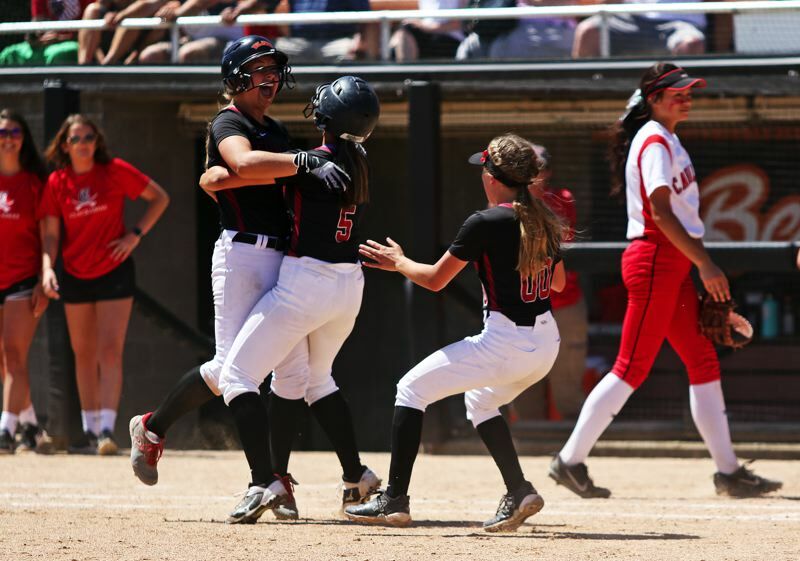 But, at that point, despite the two-run deficit and the missed opportunity, Tualatin's spirits didn't wane. "No, we never had any doubts," Olivera said. "This team, we can come back with the snap of a finger. It is crazy. These girls are outrageous." 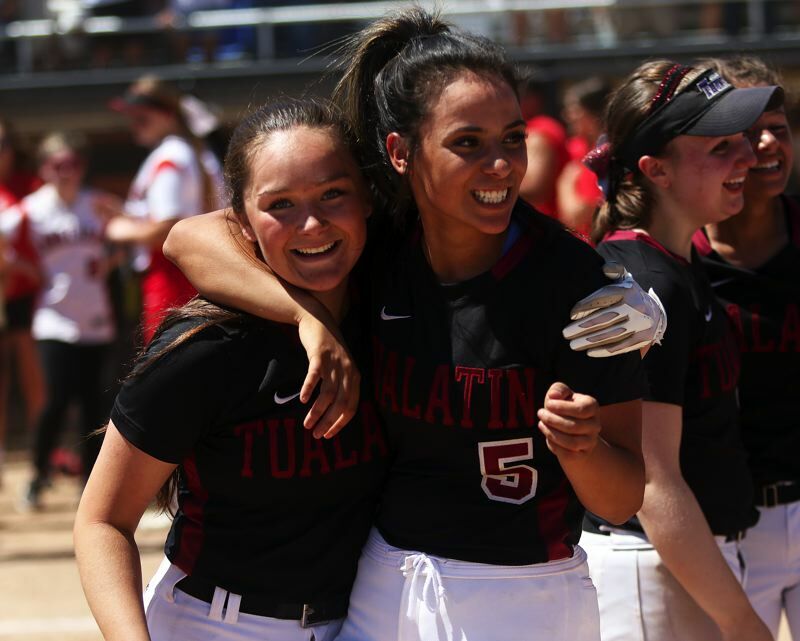 "I've never been on a team that can come back better than this team, and we never give up," Tualatin senior third baseman Taylor Alton said. "We never stop fighting." "There's always doubts, and (Clackamas) really brought it today. They were a strong competitor," Woodward said. "But I knew that my team had my back, and our bats would come alive eventually." Hillier led off the bottom of the fifth inning with a line-drive single to right field. Johansen then came up and blasted a home run over the fence in center field, tying the game at 3-3. "That felt amazing. I've had home runs over the season, but that felt amazing," Johansen said of the home run, her 16th of the season. "I'd gone 0 for 2 to that point, so I was just thinking 'get the ball in play,' and score Ella, but that's the way it happened, and I'm not really complaining." "I knew that was gone the second she hit it," Hillier said. "Sometimes, you can just hear it. That brought us back in the game, and that lit the fire for us." The teams remained tied going into the seventh inning. In the top of the seventh, Woodward and Tualatin defense put Clackamas down in order, giving the Wolves the chance to get a walk-off victory. Hillier, leading off the bottom of the seventh, ripped the first pitch she saw for a single to center field. 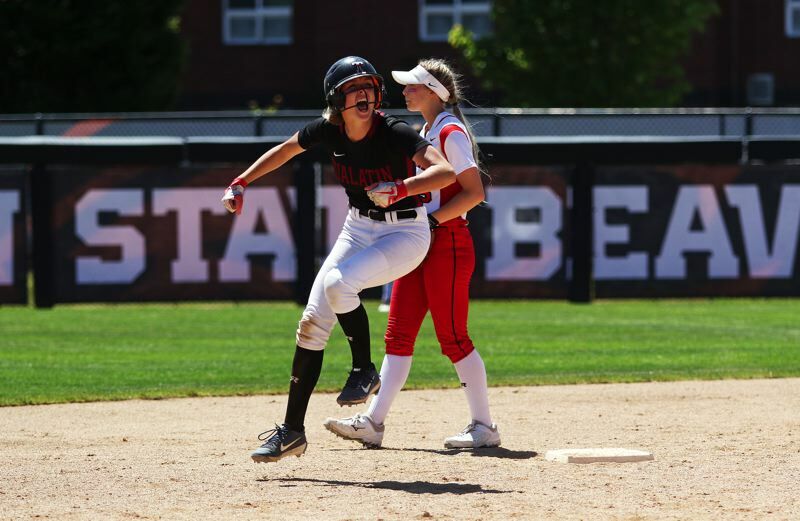 "I knew (Clackamas senior relief pitcher Nicole McBride) had a lot of pressure on her and, I guess, I had a lot of pressure on me, too," Hillier said. "I knew she was going to try and strike me out, just as much as I was trying to hit off her, so I knew the first one I was going to see, I was going to smash." "That was hammered," Johansen said of Hillier's hit. "That was awesome." One out later, Alton hit a ground single to left field, with Hillier moving to second base on the hit. That brought up Corcoran, with a chance to win the game. "There was so much adrenaline rushing through me, I was thinking 'just relax, and hit the ball solid,'" Corcoran said. That's exactly what she did, hitting an opposite-field line-drive single to right field. "I got my pitch and I drove it," Corcoran said "I was just looking to go wherever the ball took me. I got one of my favorite pitches, and it was the height that I like, so I took it. I didn't even feel it coming off the bat." Hillier, sprinting around third, scored on the play, giving the Wolves the 4-3 victory. "I was just thinking, 'don't get thrown out at home, and just run as hard as I could, cross home plate, and it's done — we did it,'" Hillier said. "It was relief and so much excitement, knowing that everything we've done ended when I touched home plate, and we came out on top." As Hillier touched home plate, the Wolves came running out of the dugout, with all of them sprinting out to mob Corcoran at first base. "I was running to first, and when I heard the cheers I knew we won, and it was absolutely incredible," Corcoran said. "It was indescribable, the feeling that I had. It was amazing. We all knew we could come back, because we had before. We were prepared to come all the way back and win." "I just started screaming. I couldn't stop," Olivera said. "I saw Ella coming in and the minute she touched home, I ran straight to Taylor. It was amazing." "She's such a stud," Woodward said of Corcoran. "We have her in the lineup for a reason. She's such a solid player. We're so lucky to have her. She's been hitting the ball all season. We knew she'd get the job done." "We just all knew that we were going to come back, eventually," Valdes said. "It was just a matter of time. We were going to fight to the end. I'm just so happy right now." "It was a little scary, but, playing them already, we knew they'd come out strong," Laird said. We just needed to calm our nerves, and then we were able to get the confidence and come back and win." 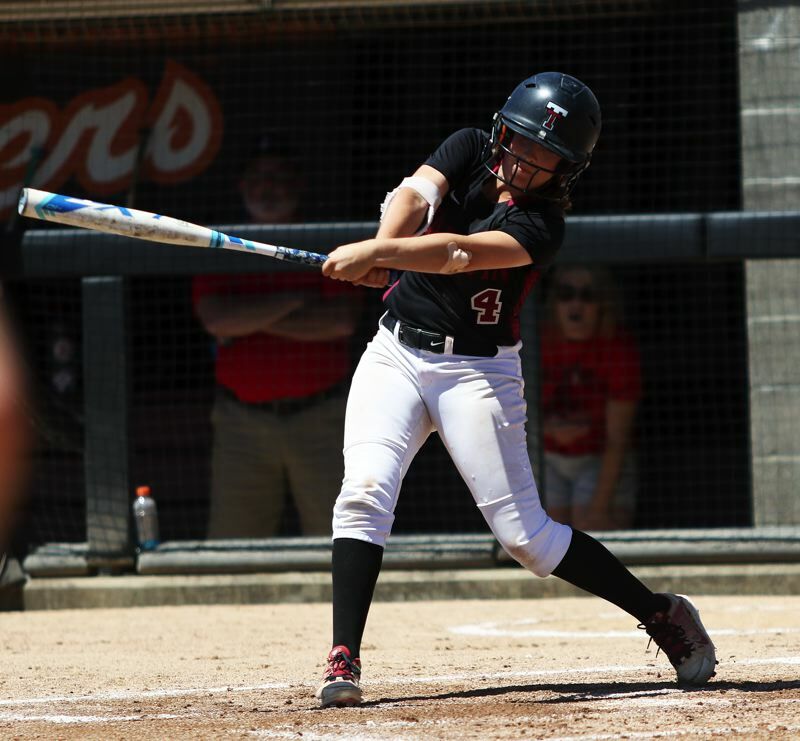 Tualatin, as a team, had nine base hits in the victory. Hillier helped lead the offensive attack, going 3 for 4 at the plate with two runs scored and an RBI. "I knew Megan was going to spin the ball, like she always does, and if they hit it, we wouldn't have any errors," Hillier said. "Our defense is solid. It was just a matter of our bats coming alive, and they did." Corcoran went 2 for 4 with a double and an RBI. Gomez hit a double and walked twice. Johansen had the two-run home run. Ridings had a hit and a run scored. Alton had the other Tualatin hit. 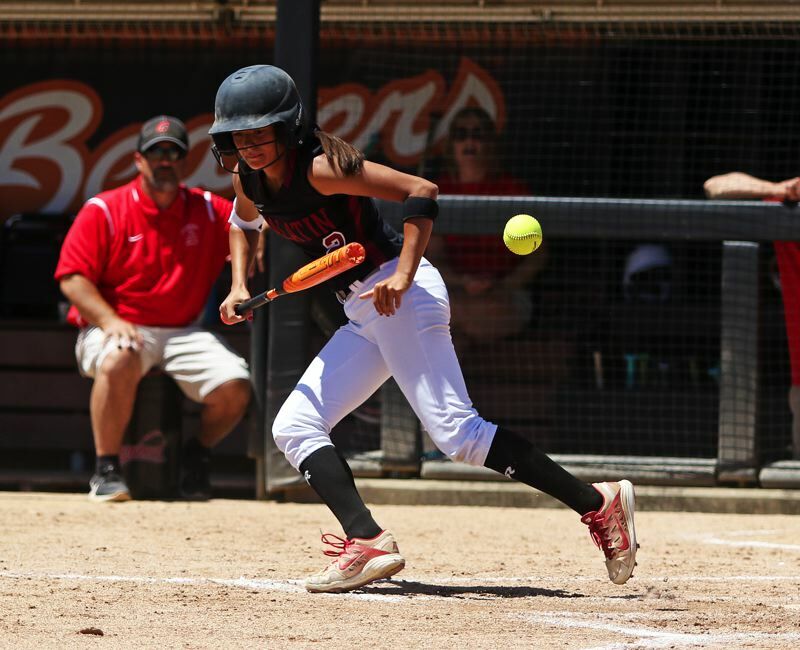 "I'll remember the girls," said Olivera, who reached base twice in the championship game. "This group of girls has been so amazing, and I'm so blessed to gone out with them. This is the team everybody wants. Everyone gets along, and everyone is so nice. I was having a rough day today, and everyone was picking me up. We stay up." Woodward got the pitching win. In seven innings of work, she gave up three runs on nine hits, while striking out five and walking none. "I knew my defense had my back, I just couldn't let them get home runs," she said. "I really wanted to let our bats do the work, and not let them score any more." For Clackamas, Loeb went 3 for 3 at the plate with a double, a home run, two runs scored and an RBI. Vanderbout and Danielle each had two hits. Other players for Tualatin include junior Lily Marshall, sophomore Sydney Wagner and sophomore Savannah Braun. Jenna Wilson is the Timberwolves' head coach, with assistants Bill Wilson and Mike Jodoin. Elizabeth Hillier is the team's manager.